If you are managing the marketing activities of a non-profit organisation or charitable institution, you are probably interested in paid search to increase the reach and donations for your organisation. Since April 2003, Google has developped a donation program called Google Grants. The program awards free Google Adwords advertising to selected non profit organisations to promote their website, recruit volunteers and raise money. Over the last 7 years the program has supported over 4,000 organisations in 15 countries ( including Australia) with an estimated $272.3M worth of advertising. With up to $10,000 worth of advertising per month ($330 per day) with no time restrictions, joining the Google Grants program could have a positive impact on your organisation's goals. All this free budget, could be used to increase donations, promoting any new initiatives or recruiting volunteers. In Australia, the program is open to any non profit organisations in the fields of Arts, Education, Health, Technology and Science. To be eligible your organisation must be endorsed as charity organisation by the Commissioner of Taxation or prescribed as charitable institution in the Income Tax Assessement Regulations of 1997. Obvioulsy some restrictions exist for political, religious, and membership based organisations as well as for organisations using Google Adsense on their websites. To apply for the Google Grants program, you will need to meet the program requirments and then fill in an application form providing quite a lot of details on your organisation. The Google Grants Commitee will then review your application and get back to you. From experience, the review period can take up to 6 months, so be patient because it is really worth it! When choosing a SEO tool, it is important to know exactly what you really need. If you look around in Google, you will find a vast amount of tools performing a lot of functions, but very often you wont need half of them. After reviewing and using some SEO packages (all in one), I realised that ,in most cases, I did not use all the functionalities, or some functionalities were quite weak so the investment was not always worth it. Instead of using one SEO package, I found more useful and often cheaper to use different tools. The tools listed below are some of the ones, I use most.Obvioulsy it is a personal opinion and not an exahustive list. OpenSite Explorer has recently been released by SEOMOZ. It is essentially a backlink analysis tool. OpenSite Explorer can be used for free, but it offers a lot more functionalities when you have a membership with SEOMOZ. OpenSite Explorer is similar to Yahoo Site Explorer, but with a lot more features. You can analyse the backlinks of your site or any competitors websites and obtain information about the domains linking to them and the anchor text they use. In my opinion, it is one of the best tool for link building research. 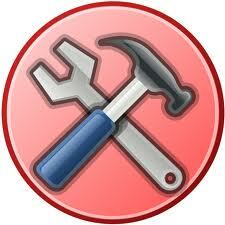 Advanced Web Ranking is essentially a ranking monitoring software. It does the painful job of measuring the results of your SEO activities. I have personally reviewed a few and this one have provided the most accurate results. Advanced Web Ranking allows to measure the progress of rankings over time and see the evolution over a period of time. Advanced Web Ranking is not free (unfortunately). The standard version comes at $99, but I have found the Professional edition ($199) the best. Firebug is one of the most popular web development plugin for Firefox. While it is more a web development tool, I have found it very useful to inspect the HTML code of a page without having to go through the page source every time. The inspect function let you view the code directly on the webpage. You can therefore find any on-page optimisation weaknesses ( missing Heading tags). Web Bug is a free software, which allows to view the server response for a web page. Obvioulsy this a kind of geeky tool with very limited use, but I do use it frequently when I perform website audits. Web Bug will be quite useful to highlight redirects and server response issues, which might affect the optimisation of a site. SEO Quake is a nice Firefox extension, which summarise some SEO parameters ( PageRank, age of the site, etc...) while browsing on a site. While the data is limited, the toolbar is quite useful to quickly scan and evaluate the value of a website. Another useful plugin providing pretty much the fuctionality is SEO for Firefox, so feel free to compare and choose the one you prefer. There have been a sharp increase in the number of search roles in the quarter coming up to the Christmas period, perhaps companies are ramping up for the silly season to get customers spending their hard earned dollars. Here are a few search jobs you may be interested in. Every year on the 3rd Thursday of November at 12:01 am, the Beaujolais Nouveau, the first French wine of the vintage, is released world wide. Interestingly, the release of the Beaujolais Nouveau is not only a major event for wine enthusiasts, but has also a dramatic impact on search traffic. 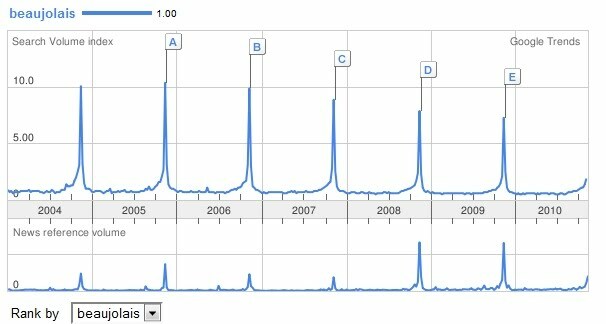 As you can see, every year at the same period, the traffic for the term "beaujolais" increases dramatically compared to the usual level. The popularity of the event is mirrored online generating searches. Obviously the Beaujolais Nouveau is not the only case and many other popular events do generate similar spikes in traffic. For example the Melbourne Cup has a similar effect on the term 'betting' (see below). Every year in November, the volume of search for this term increases dramatially as punters look for tips to place their bets. In most cases, the traffic generated by an event does not last long ( a few days or weeks before and after the event), however it remains a major opportunity for industry players. As a french wine online retailer or for a wine related website, the traffic generated by the Beaujolais Nouveau can bring a lot of new visitors and generate sales. Likewise, the Melbourne Cup offer a tremendous opportunity for any business in the gambling/horse racing industry. The main advantage of events generated traffic, is the fact that is occur each year at the same time. There is no surprise effect and there is all year to be ready. Being able to plan in advance for the event, offers plenty of opportunity for SEO. Some content can be created a few month before and some links can be built to give the 'event page(s)' maximum opportunities to rank high on D-Day. For yearly event, the optimisation can be improved every year. SEM (Google Adwords, Yahoo Search Marketing) can also be an opportunity for the late mover. A specific campaign targeting a small range of keywords can be created and put live on the day. SEM will give you the opportunity to have full control of the message and wont require as much work as SEO. The main drawback is the cost. Obviously your competitors will also be aware of the event and try to do the same, so the cost per clicks will be high. Monitoring the spend on daily (even twice daily) is definately required. Obviously a good mix of both channels appears to be the best way to leverage the event generated traffic. The search engines and referring sites are rather self-explanatory, however the direct traffic and others categories can be somehow confusing. In today's post will be focusing solely on Direct Traffic. - Typed your URL directly in their web browser and reach your website. - Bookmarked your website and clicked on a bookmark to reach your website. Google's definition is exact, but is rather simplified. Such short cut has contributed to a common misconception of direct traffic visits leading to misleading interpretations of analytics data. In many cases, Direct traffic is much more than just bookmarked and URL-typed visits. Google Analytics classify traffic as Direct when a user session has been started without a referrer being passed by the user browser. All this means that a direct visit is not ONLY a bookmarked or URL-tpyed visit. Based on the complete definition, the Direct Traffic bucket is often filled with a large array of visitors. - Visits coming from an email signature. If someone clicks on a website link in a email signature in Outlook, no referrer will be passed to the user browser and this visit will be attributed to direct. - Visits coming from an untagged email campaign. When someone clicks on an untagged link (link which does not include a Google Analytics tag) from in their email client (Outlook, Lotus Notes or Thunderbird), no referrer will be passed and the visit will be classified as direct. This is actually one of the most common cause of spikes in direct traffic. It is therefore very important to correctly tag email campaigns. Note: This only applies to email clients. If someone clicks on a link from a Webmail (Hotmail, Gmail, Yahoo), the visit will be classified in Referring traffic. - Visits from Shortened URLs in Facebook, Twitter or Social Media. The shortened URLs do not pass referrers, so all your traffic coming from your shortened Twitter updates will be classified as Direct. To ensure it is classified in the right bucket, make sure you tag your URLs. - Visits from a user in a secured environment or intranet, where the Firewall or Proxy strips the referrer leading to the referrer not being passed. - Visits from Mobile Ads. As outlined by Avinash Kaushik, untagged mobile ads link will be classified as Direct. - Visits from a Page of your website missing the Google Analytics tag. If someone clicks on a link from a page of your website,which does not have the Google Analytics tracking code, the visit will be reported as direct. It is therefore quite important to ensure that GA tracking code is added any new page you might create. - Visits coming from a link on a HTTPS page pointing to a HTTP page or on a HTTP page pointing to a HTTPS page. For security reason, the referrer is not passed on this type of links and therefore the visit will be categorised as direct. A quick fix is to ensure that your URL are tagged correctly. - Visit from someone, who has modified its browser configuration to avoid passing the referrer ( not so common). - Visits from unproperly coded Redirects. 301 Permanent Redirects usually pass the referrer information so your traffic will be classified correctly, however in some cases, 302 Temporary redirects can lead to visits being classified as direct traffic. Obviously there are a few more cases, when Google classifies traffic as direct, but this list should outline the most common cases. 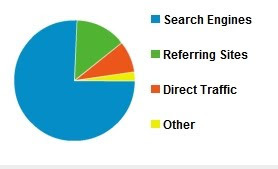 As you can see, Direct Traffic is much more than just people typing your URL or bookmark generated visits. Keeping this in mind can be really useful when it comes to analyse your data and understand the different trends in direct traffic. After a long wait, SEO Sydney Blog has finally published the results of the 2010 Australia and New Zealand SEO SEM Salary Survey. (You can download the results here). For a little bit of background, the 2010 survey started in April 2010 following the same template as the 2008 and 2009 surveys. In 2010, we had 59 respondents, which we would like to thanks for their support. After collecting and analysing the results, we finally got all the information we were looking for. In 2010, the SEO and SEM industry in Australia and New Zealand has evolved compared to the previous years. While quite predictable, the 2010 Survey results show that the industry is getting more and more mature. - The age of SEO and SEM professionals has increased compared to 2009 and 2008. In 2010 52.5% of all respondents are below 30. They were 64.5% in 2008 and 64% in 2009. - The SEO and SEM professionals are also more experienced. In 2010, 63% of professionals have 3 or more years of exprience. They were 51.5% in 2009 and 42.4% in 2008. - With more experience, SEO and SEM professionals have also worked for more companies than before. In 2008 32.5% of respondents had worked for more than 3 companies, they were 39% in 2009 and 52.5 % in 2010. - More experience is also translated with higher salaries. In 2010 55% of SEO and SEM professionals earn more than 60K a year. They were 50% in 2009 and 45.4% in 2008. Although not a break-through, the results of the survey provide some useful insights for both recruiters and candidates (Please feel free to check our SEO recruitment guide as well). As a recruiter, it is more and more important to offer salaries in line with experience. Candidates with 3 or more years experience will be less likely to accept anything below 60K. If they are on this wage or below, they might also be looking at other companies to get a payrise. 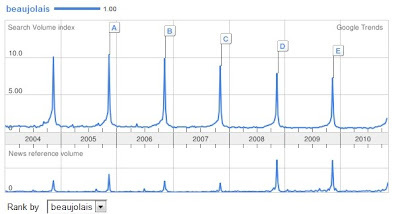 Back in December 2009, we wrote a post on the issues that Google faced with real-time search. At this time the integraton of real-time search and especially Twitter updates in Google's search engine result pages showed some weaknesses. Since then, things have changed and Google has reviewed its way of indexing documents and build a completely new search index called Google Caffeine. On July 8th, Google has officially announced and explained the Google Caffeine. The orginal Google search index was built some time ago, when the Internet was much smaller and very different. In the last couple of years and even months, the content on the internet has increased dramatically and the need for instantaneous and fresh information has put a lot of pressure on the Google search index resulting in large delays to display the latest information. The 'old' Google search index was build around layers. Each layer was updated at different rates (some layers were updated more frequently than others for example for Google News), but the main layer or main index required to crawl a very large amount of web pages to be fully updated. This process could take up to 30 days to integrate newly created pages in its index. Although Google does not give a lot of information on what it is radiacally different, Caffeine appears to have higher crawling capabilities. The crawling process has also been reviewed. Rather than crawling the entire web at once, Caffeine crawls smaller portions and update the index on constant basis, which would improve the freshness of information. At this stage, it is still early days to see the difference and measure the real effect of the changes. After having published a few posts since the Google Caffeine release, I have noticed that most of my posts were indexed in the next 30 mins after the post has been published. Not sure if it is because we use Blogger, but it seems to be working quite well so far! Setting up a SEM budget might seems like the easiest part, when considering advertising your business or products in search engines, however making the wrong decision with your budget allocation can have a bad impact on your campaign ROI. A budget too high will result in some money being 'wasted' on not relevant terms or non converting terms . On the other hand, a budget too low is likely not to capture relevant traffic and will represent a high opportunity cost. Based on experience and best practices, we have outlined some tips, which we hope will help you set your budget and maximise your campaign return on investment. This basic marketing principle is often overlooked when setting up SEM budget, which often result in inflated budget. For some reasons advertisers often think that they can spend without limits, but search traffic is a limited demand environement. Having a budget much higher than the search volume is often the cause of poor performance. By forcing to spend more, the advertisier is likely to pay more for a click or select keywords which do not bring qualified traffic and therefore lower its ROI. Before choosing a budget, make sure you do a quick research with the Google Adwords keyword tool to see the actual search volume. While useful, remember that the data is only an estimate and is likely to be different from the reality. 2) Take seasonality into account. Seasonaliy is an important factor to consider when setting up your SEM budget. Search demand is not flat and depending in your industry is might vary based on the time of the year or special events. If you are an online retailer, the Christmas season will generate a much higher demand than usual, so your SEM budget needs to reflect this. If you are an accountant, the end of financial year will see an increase in search demand, which should be reflected in your budget. Again the Google Adwords keyword tool can help you to identify seasonal trends. Setting up a budget for 12 months based on estimate is a risky exercise. 99% of the time, the estimate will be wrong so you budget is likely not to be fully aligned with the search demand. Reviewing your budget every 2 to 3 months and adjusting it based on the demand, will make sure that you search engine marketing spend is in line with the search demand. Do you want to work for a leading digital agency, helping clients achieve there search goals. Do you want to implement Search Engine Marketing (SEM) and Digital Marketing solutions including Pay Per Click Advertising (PPC), Search Engine Optimisation (SEO), Performance-Marketing and Social Media Strategies. Do you want to help clients achieve there commercial goals. If so an exciting permanent opportunity has come up for a talented SEO and SEM specialist to join the team. First Rate, a search marketing agency, is looking for an Account Director to join its marketing and business development division. • Grow agency revenue from new businesses by pitching search marketing to potential new clients. Back in August 2009, we wrote a post on the Facebook user statistics in Australia. Over the months, this post has generated a lot of interest. While a small market, we thought it would be valuable to provide the same type of data for the New Zealand market. 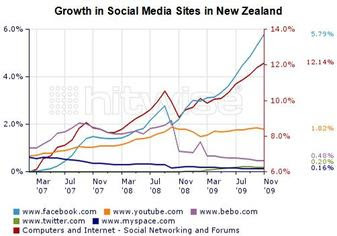 Looking at the growth of the most popular social media webistes from 2007 to 2009 (Hitwise 2009), Facebook has recorded the highest growth of all social media sites. On the other hand, Bebo and MySpace has lost a large share of audience most likely to Facebook. According to CheckFacebook.com, there are 1,675,540 Facebook in New Zealand, which represents around 49.87% of the overall online population. Compared to Australia (55.6%) and the US (57%), Facebook has a slightly lower penetration. While representing only 0.36% of the global Facebook population, targeting New Zealand Facebook users offer great oppotunities for companies looking at generating brand awareness or selling products locally. In terms of demographics, the New Zealand population is dominated by womens with 56.4% of the entire population. In proportion, the New Zealand population is more feminine than in Australia (54.3%). The largest age group is the 18 - 24 years old (24.7%) followed closely by the 25 -34 years old (24.5%). 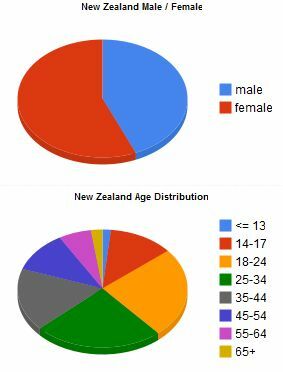 Interestingly the 35 + represent 36.8% of the overall New Zealand population including 19.6% of 45+ users. Compared to Australia, the New Zealand Facebook population has a larger proportion of 45+ users (NZ: 19.6% AU: 17.1%). The success (or failure) of a SEO project is very often entirely attributed to the SEO consultant or agency, however the client itself has a critical role to play in the outcome of a SEO project. Over the years, I have heard of projects stalling or not delivering the expected results partly because the client did not communicate correctly with the agency, did not play its expected role in the implementation or simply because it did not expect to have anything to do with the project. Do not get me wrong, I strongly believe that the SEO agency or consultant is the main warrant of a SEO project's success. The consultant has an expertise and that is why is being hired. The consultant needs to have skills, experience as he is the one, who do the researches, analysis and recommendations. The consultant should also be a specialist in communicating effectively with the client whatever the client's personality. The consultant should be able to deal with client's request while pointing out the main priorities and tasks of the project to deliver the appropriate results. What I am trying to say, it that clients have an important role to play in the project outcome as they plays central roles at various dimensions of the project. In most case, they need to be pro-active and distribute resources effectively to ensure maximum results. One of the most important role of the client is the implementation of the SEO recommendations. In many projects, the SEO consultant is hired to provide analysis and recommendations on how to improve a client's website rankings, but does not actually do the implementation. Most of the time, the implementation done by the client IT team or a third party provider. The SEO Consultant plays a role in assisting the client with the implementation, however the client do need to allocate appropriate resources to make the correct implementation possible in a timely manner. Often overlooked, but crucial is the initial client briefing. Although the consultant will do in-depth research on the project, nothing replace in-house knowledge. The client is the best to know its industry and business and should try to circulate this information as best as it can to the consultant. Very often approximate briefs jeopardise the SEO project effectiveness. On the same topic, it is likely that the SEO consultant will have questions, which will need answers. Late and approximative replies, often leads to project delays and confusion. Being available is therefore highly important to ensure that the SEO Consultant can work properly. When the project involve different party such as 3rd party vendor or different departments within the client's company, it is crucial to insure appropriate communication, resources allocations and coordination. For many political and organisational reasons, SEO Consultants are often not in a position to contact other departments or 3rd party vendor directly. As a result the client should make sure that flow of communication is correct and that each party cooperate and can interact effectivelly. As a summary, I hope this post will make sense to clients and SEO consutants. For the client to better understand how to work with a SEO Agency. For SEO consultants to remind that the client has an important role to play too and he/she should therefore be involved in the project. At the end of the day each party will benefit from an effective cooperation. An exciting opportunity has come up to work for TPN, an Australian performance marketing network. As a senior affiliate manager, you will be responsible to manage a wide range of online advertising campaign for TPN's advertisers including CPC and CPA campaigns. You will also work on the acquisition program for a 400,000 members in-house list including recommendations on landing pages, creatives, A/B Testing and developing strong relationships with overseas performance networks. Ideal canditates will have a marketing or technical degree with a good understanding of the different online marketing techniques. Excellent attention to details, good communication and time management skills are also required. April is here and it is time to run our 3rd edition of SEO Sydney's traditional SEO/SEM Salary Survey for Australia and New Zealand. We have been running this survey for the last 3 years with the objective to provide more visibility for employers and job seekers on the salary expectations in the SEO/SEM industry. Our readers, recruitment professionals and employers has demonstrated a strong interest in the 2008 and 2009 results so we have decided to carry on. - 10 Easy Questions (won't take more than 5 mins). - All the results will be published on SEO Sydney Blog for FREE. If you are working in SEO or SEM, please feel free to take the survey and forward it to your friends or colleagues. Thanks for your support! Building links is a long process, which requires research, constant attention and overall a significant amount of time. Over the years, I have noticed that many companies and agencies start their link building process by looking at potential links from other websites before even considering improving the linking structure within their own website portfolio. It is like looking for gold in your neighbours' backyard, before even digging your own! If you look at top global companies, most of them have a large website network, which is significantly under used when it comes to link building. I also went through the SEOMOZ Professional Link Building Guide (definetely worth reading) and unfortunately I have not referenced any mention to this tactic either. Generating links from your own websites, is obviously not the most crucial element in a link building strategy, however if used properly, these untapped resources can have a dramatic impact on a website's link popularity. - The most common technique is obviously a footer link, which link to all other websites in the network. - Many websites uses Company profile pages, which outline the profile of one site with direct text link to the other. Such technique is relatively easy to implement and is quite effective. - Beyond basic footer links, it is advised to link relevant sites together. Links between two sites with related content, will have more impact that a link between unrelated sites. - Even better it is strongly advised to link from relevant deep relevant content pages from a relevant site to another. Such type of links will have the best impact, while bringing value to the user. - Over-using this tactic could obviously have a negative impact. Overlinked websites can be penalised, so it is recommended not to abuse the technique and limit the number of links inter websites. Obviously the links opportunities are endless. Creativity and measure are your best guides to effectively use your website portfolio for link building. Remember these links are the easiest to create, so it should be the starting point of your link building campaign. When Matt Cutts said that it was NOT an influence, it shattered many people’s PageRank sculpting theories and practices. Therefore, this was an assertion that required testing and the tests did indeed show that the addition of the nofollow tag did not affect the PageRank of other subpages. However, it was unclear if this was because it had no effect at all or because the effect was not large enough to increase the PageRank to the next highest whole number, e.g. 4.75. Another observation made during testing was that 10 hyperlinks linking from the home page would reduce the subpage PageRank by one, e.g. PR5 to PR4. If there were 100 hyperlinks on the home page, using the nofollow tag reduced subpage PageRank from PR5 to PR2 or PR3. This contradicted the common interpretation of what Matt Cutts had said. It was clear that blocking a hyperlink does have some affect on the PageRank value of other subpages. Moreover, this makes sense because otherwise we could infer that an unlimited number of hyperlinks would produce the same PageRank value. This is of course untrue. It would be interesting to hear Matt Cutts explain this matter in more detail. Furthermore, testing resulted in the conclusion the hyperlinks tagged nofollow remain discoverable. Google follows these “nofollow” links but does not factor them in to the PageRank value. So rather than “no follow”, it would be more appropriate to call them “no vote”. In addition, it is important to keep in mind that there are countless other factors involved, many of them impossible to quantify from our end. In addition to PageRank, Google uses on-site positioning, navigation depth, and off-site elements, such as link and contextual references. This makes the task of testing PageRank all the more difficult. In conclusion, the testing led us to the belief that a webmaster can better spend their time generating content or working out a link deal. Constructing a nofollow structure may not be a waste of time but it is clearly not as valuable. This post is provided by Dejan from Dejan SEO, a search engine optimisation company specialising in advanced link building techniques. The first thing to understand is that recruiters are usually working very quickly. We have to deal with hundreds of people and CVs every week. This means there isn’t really a lot of time to pick apart your CV in great detail. You need to make a strong impression, fast. Even if you’re dealing direct with an employer this holds true. A hiring manager is trying to do their day job while taking time out to read 10+ CVs. Studies show you’ve got less than 30 seconds to get your message across or the person reading your CV is gone and onto the next one. 1. Ask yourself, can you honestly do this job? It’s important to think before applying – if you apply for too many jobs you’re not quite ready for, chances are people will notice and not take you seriously for the jobs you can do. 2. If you can do the job, why? Don’t send a generic cover letter, send a cover letter that passionately explains why you are right for the role. Point out where you have relevant experience that the ad says you must have. So many people miss out on jobs because they have not shown evidence of why and where they have gained the relevant experience. 3. Your CV must show relevant experience that is asked for in the ad / job description. Check your CV to make sure it says you’re an obvious choice for the role. Highlight your relevant experience, make it prominent (ideally first page!). 4. Put at least 3 key achievements in your CV for each job. Doing the job is one thing, measurable results are something else entirely! Stand out from the crowd with what you’ve achieved. 1. You have to market yourself – it’s no longer about who you know, it’s about who knows you! 2. There’s a variety of great online resources (like Linkedin) that help you do this. Make sure you have an online profile(s) that’s easy to find and keep it up to date. 3. Even if you’re not actively looking for a job, it’s always worth understanding what the market is doing and building relationships you can leverage at a later date. As they say, you create your own luck! Previously we covered how to manage basic landing page opimisation with Omniture Site Catalyst, but one of the most common question I come across from businesses using Omniture SiteCatalyst is: How my SEO activities perform against my key metrics and against other online marketing channels such as banner, SEM (Pay Per Click) or email ?. While such question is easily answered with Google Analytics (or other tools) because the organic search traffic is already classified under "organic" in the Traffic Sources report, it is actually harder to provide a straight answer to someone who has a basic Omniture SiteCatalyst package. Omniture SiteCatalyst is great for many things, but for some reason they made it difficult (and more expensive) to access some of the most basic performance data of your website. If you do not have fancy settings or access to Discover or Data Warehouse, it is actually very hard to compare the effectiveness of SEO against any other marketing channel. The main reason being that SEO traffic is recorded as a traffic variable (s.Prop) whereas any other marketing campaign is recorded as a conversion variable (eVar). A VISTA rule is a powerful server-side feature provided by Omniture, which basically populates data into a pre-defined variable without the need to alter the SiteCatalyst implementation. Using a VISTA rule to segment your SEO traffic is the easiest solution but as many Omniture products it comes with an extra cost. One of the most common version of the VISTA Rule for this purpose is called Unified Sources. The biggest advantage of Unified Sources is that it will classify any source of traffic under pre-defined categories such as organic search, banners, paid search (same as the Traffic Sources report in Google Analytics). If you are already using tracking codes for your online marketing campaigns, you are almost done because all your online marketing activities will already be classified. The VISTA rule will only need to populate the corresponding eVar with the organic search engine data so that you can compare each traffic source in a easy to use report. Once implemented, you will have a clean report, which will let you compare you SEO traffic against any other campaigns and metrics. Discover, Data Warehouse and ASI segments are really similar. An ASI Segment is basically a segementation tool provided by Omniture (Discover and DataWarehouse actually use segments). What it does, is isolate specific traffic segment based on a set filter. If you are familiar with Google Analytics, an ASI is what you can get with the Advanced Segementation Feature. By creating an ASI segment, you will create a specific Report Suite, which will solely focus on SEO traffic, you will be able to measure your organic search traffic against key metrics of your site. If you want to compare your SEO traffic against other sources, you will need to run different reports and then do a bit of manipulation to reconcile them. Data Warehouse, and Discover will provide a similar solution, but you won't be able to access your data instantly and will need to run a report (which take time) everytime you need it. If you have access to your Omniture SiteCatalyst admin console or Discover you can set up your ASI segment yourself using the Advanced Segment Builder, otherwise contact your Omniture representative and he/she will be able to do it for you. If you have Data Warehouse, the process is similar, you will need to create a segment ,but you will then need to run a report to access the data. Basically, the segment should be configured to include all data from search engines. In Omniture is it defined by choosing a container and including Search Engine as greater than or equal to [exclamation point]. Then you will also need to make sure that the segment does not include paid campaigns. In Omniture SiteCatalyst paid campaigns are recorded using a specific eVar (Conversion Variable - most common example is Tracking Code). The segment should therefore be set to exclude all data where your paid campaign is less than [exclamation point]. You then just need to click apply and you are all set. Once done the data in the segment will be only organic search traffic. You can then compare it to your other campaigns and measure your SEO results against other metrics and traffic sources. Measuring the results of your SEO efforts can be done with Omniture SiteCatalyst, but in a more painful way that you would expect from an analytics package of this cost. It is however very hard if you do not have the budget to pay for a VISTA rule or no access to Data Warehouse. Such situations contribute to make Omniture SiteCatalyst quite a frustrating product to use when you consider you can get this data with Google Analytics for free. This is such a shame as SiteCatalyst is a great product. Most frustrations could be reduced if Omniture considered to offer Unified Sources as a out-of-the-box feature. Back in August 2009, we wrote a post on the new Google Adwords ad formats Google were trialling and it seems that it is available now in Google Adwords for Ausralian customers. The Ad SiteLink format was launched in November 2009, with the main goals of increasing search engine user choice, ads relevancy and leads quality. What is the Ad SiteLink? Rather than offering only one link to a specific landing page, the Ad SiteLink offer up to 4 additional destination URLs to deep pages of your site that might be more relevant the user search. What are the benefits and applications of Ad SiteLink? The Ad sitelink offer the opportunities to funnel your Google Adword traffic in more targeted landing pages and therefore improve the conversion rate of your text ads. While this makes perfect sense in theory, I have not tested it and therefore would not assume that this is the case. One of the best application for the Ad SiteLink ad format is for brand campaigns. While running brand campaign, search engine user might click to your brand ad with different goals especially if you brand offer different products, so a text ad directing to a unique landing page might not be the most relevant. Let's take the example of Telstra, Australia's largest phone company. Telstra offer a large range of services including mobile phones, internet connections, business phones and home phones. Considering Person B is looking for Home phones, he or she is likely to click on the Ad, however Person A won't fine much relevancy in this ad and might not click. If Telstra offered a Ad SiteLinks with a specific links for each product line it is likely to improve the performance of its Adwords campaign, especially the click-through-rates. The Ad SiteLinks feature should also be really effective for ponctual promotion and special offers. How to get a Ad SiteLink? Ad SiteLinks are available in Australia. When Google launched the new feature, it only made it available to a selected number of advertisers, who meet certain criteria, so you might not be able to set it up directly in your Google Adwords interface. In your campaign settings tab, if you can see "Show additional links to my site" under the "Ad extensions" section, you are eligible to use Ad SiteLinks. If you do not see this, contact Google Adwords support and be patient. They will eventually release the feature to a wider advertiser's audience. We are glad to welcome one of our first guest blogger: Or Hillel. Or runs SEO Jobs Finder, a worldwide SEO job board (definetely worth checking if you are looking for a SEO job or candidate). In this post, Or provides some really interesting insights and tips on how to effectively recruit SEO professionals. The world of Search Engine Optimization is a large complex one, with only a few professionals knowing the ins and outs of its structure and how to reach its boundaries, so by hiring a highly regarded SEO professional, you can really help your website bloom instead of wilt. Once you’ve got them on board, you’re sorted, but the hard part is the hunting and hiring. Discovering an SEO professional can be challenging for anyone, especially a first-timer, a virgin of the recruitment stage. The following article helps you understand the full workings of recruiting an SEO guy, from the preparations you need to make to getting the word out and how to be 100% certain that you have the top guy for the job. Advertising is the way you will get the word out about your interest in hiring an SEO professional for your website. The first part of advertising for a new job is writing the job description (sometimes known as a job specification), which you will find an easy task, IT may take some time, but not many brain cells need to be used. It simply describes the job: The tasks involved such as making URLs SE friendly, how many hours you will expect your new recruit to work, how they should contact you or update you on their progress with your site. Along with the job description, a person specification, should also be included. In the person spec, you will describe your dream candidate, not what they look like, but their character traits. You need to ensure that you will get along with the person you hire, it is vital. Additionally, within the person spec, you will ask for experience that the SEO professional has had in the past, along with examples of where you could look online so you can see some of their work in the flesh. Finally, but certainly not the lest important, you need to ask for specific knowledge that they must possess to complete the task. For example, if you work with a certain blogging system, then you will need to ensure that the recruit will have extensive knowledge of your blogging system so that they can work efficiently. However, if you find after months of trying to advertise by yourself then maybe it is time to give in and hire a recruitment agency to do the work for you. It maybe costly, but for the months where you’ve been doing it yourself, you’ve practically been throwing money down the drain. Simply give them the job spec and person spec and they’ll do the rest of the work. all you have to do is reply to (hundreds) of) emails about the interviews you’ll be holding, which bring us onto the next subheading. Now you may be questioning why this is here, you’re not the one going to the interview so why should you have to prepare? That is where your naivety shines through. The perfect candidate will have prepared every question that they could think of, but you’re the one who needs to prepare those questions. Whether it be a full blown list of things you must ask, or a post it note with some scribbled writing upon that you will base the interview on, it is vital for you to prepare, certainly if you want to make yourself seem professional to the candidate. 1.You will need to decide upon a venue for the interviews. Will your house be suitable? Or is your two bedroom flat too small for every person who applied? You need to find yourself asking these questions. The venue will need to be of a suitable size, have space to ‘hold’ waiting candidates and have space for you to ‘hold’ the interviews. It will also need to be in a suitable location, having it in a central location within a large town or city is the most ideal as it is the most likely place to have the best transport links for all candidates. However, the better the location, the higher the price. 2.Now you need to decide the timings. Are you going to give everyone the same time and do it on a first come, first serve basis, or will you give each candidate a separate time. There are advantages (and disadvantages) of both. For example, the latter idea shows greater organization skills, however, if one candidate is running late it can cause everybody else’s interview to become late. 3.You now need to structure the interview. Decide what you want the candidate to do: Do you want to sit them down, ask them some questions and let them leave. Most of this will be decided upon in preparation, but sometimes ideas come to you on the day. Just make sure you have a structured interview. The candidate doesn’t want to here your “umms” and “aahs,” it sounds extremely unprofessional. In the world of SEO, SEO professionals don’t have a set salary. Unlike doctors or vets who get paid an average salary, the payment for an SEO professional can vary greatly, obviously the lower their experience, the lower their pay. When dwelling on the salary, you need to consider how much the revenue will be increased for your website/business once they are on board. From this calculation, you can then work out how much you could afford to pay them. If you still find yourself stuck then ask the candidate how much they would expect to get paid. If they say $20,000 don’t just say that’s fine. Check you can afford it then offer them a little less. The candidate is always going to bump the figure up slightly. For more guidelines, feel free to have a look at the results of SEO Sydney Blog's SEO Salary Survey. Now you’ve read it get on with putting these words into actions. Everyday, SEO professionals are being grabbed off the market to work for big websites and businesses. You need to get out there and get whoever is best for your business and whoever will have the greatest impact. Despite a slowdown induced by the Global Financial Crisis, Australia's online search advertising market achieved a 30% growth rate during 2008-2009. According to the Australian Online Search and Directories Advertising Market 2009-2013 report released by consulting company Frost and Sullivan, online search is one of the most active areas of online business. Phil Harpur, Senior Research Manager at Frost & Sullivan, mentioned that consistent high advertiser satisfaction combined with strong level of search activity make online search a stand out segment in terms of growth in the overall digital advertising. Google still dominates with almost 90% of total paid search market share in 2008-2009. Bing has shown slow but steady growth worldwide, however it has struggled to dent Google's dominant position in Australia. - Online Directories will rely more and more on online advertising as advertisers will tend to prefer free listings rather than paid ones. - SEM and SEO are getting more widely adopted simultaneously rather than exclusively. With more skilled individuals combined with the need for integrated strategies, Frost and Sullivan predicts that SEM will be deployed with SEO.